So I needed a new mascara AND Rimmel just happend to release a brand new mascara .... well that isn't a coincidence is it? Totes meant to be! So as soon as I could get my hands on it this beauty was straight in my basket and bought before you could say - long lashes! I've been using a Maxfactor mascara for a while but I do try and re-purchase mascaras every 3 months or so, someone once told me that after 3 months there is enough bacteria in a mascara to kill a rat.... and I don't really want that near my eyeball! My holy grail mascara is Maxfactor's Masterpiece Max and it has been for years, but I seem to be on a constant mission to find something better so when new mascaras are released I'm on it like a ninja turtle on pizza! This is the new mascara from Rimmel. I haven't used a Rimmel mascara since buying the Lash Accelerator last year (which I love) so it was about time I went back to them. What drew me most to the Wonder'full mascara, apart from the fact it's new, is that it is made with Argan oil! I swear this ingredient i slowly making it's way into every single product possible! It is said to leave your lashes feeling conditioned and soft - sometimes, especially after a hot day in summer, my eyelashes can feel so thick and clumped that this sounded like the perfect product for me to try! 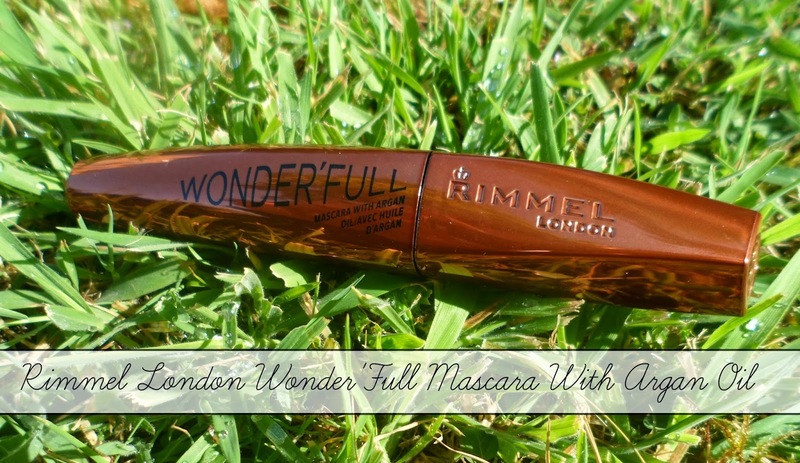 It comes in a cute curved copper/bronze tube - I like that Rimmel always try to make their mascara packaging completely different to the last, this looks like nothing else in their range. I had to check the brush before investing - I'm really not a fan of thick, bushy brushes - I have really small eyes so bushy, fluffy brushes just don't work out well for me. The brush had is fairly big (compared to things such as the masterpiece max) but I love the thin, spikey bristles - that's my kind of comb! I find it so much easier to coat my short, stumpy lashes with brushes like this! The bristles feel really soft and light aswell, better than those dagger, death traps which aim in life is to poke your eye out. But this is lovely! I'm normally not that keen on brushes that are a bit flimsy and bend easily but I could actually use this beaut with ease! Wahooo go me! My lashes become separated with just a coat or two and what I love the most is that it's NOT clumpy! This little newbie is only £5.99 - a massive bargain in my opinion! This looks like a great mascara! I cant wait till this hits the stores in USA! Will be reviewing it on my blog. I'm in need of a new mascara so I definitely want to try this out. Thanks for the review! I'm so glad I've seen this review! I recently saw this advertised in the ASOS magazine and thought "Argon oil in a mascara?!" and I've been waiting for a review ever since. It sounds amazing for £5.99! I literally just heard somebody raving about this on Twitter yesterday. I'm a mascara fiend.. literally, you'll find about 6 that I'm currently using in my stash. Haha. Think I'll have to add this one to the list! After seeing this review I ran out and brought one - I don't often wear mascara but I decided I needed a new one (after seeing your rat fact, eww!) and I agree with you - it goes on so nicely and not clumpy at all! Thank you for sharing this! I bought this the other day, purely for the argan oil and I LOVE it. Wow! Very interesting. Moroccan Argan oil works really well to repair damaged hair. I use the brand Pro Naturals, it leaves my hair super shiny and smells amazing. My 2000 Followers Worldwide Giveaway!